Tucked in the spruce forest on the edge of the Courchevel valley, La Tania is just a stone’s throw from Méribel and the rest of the Three Valleys. 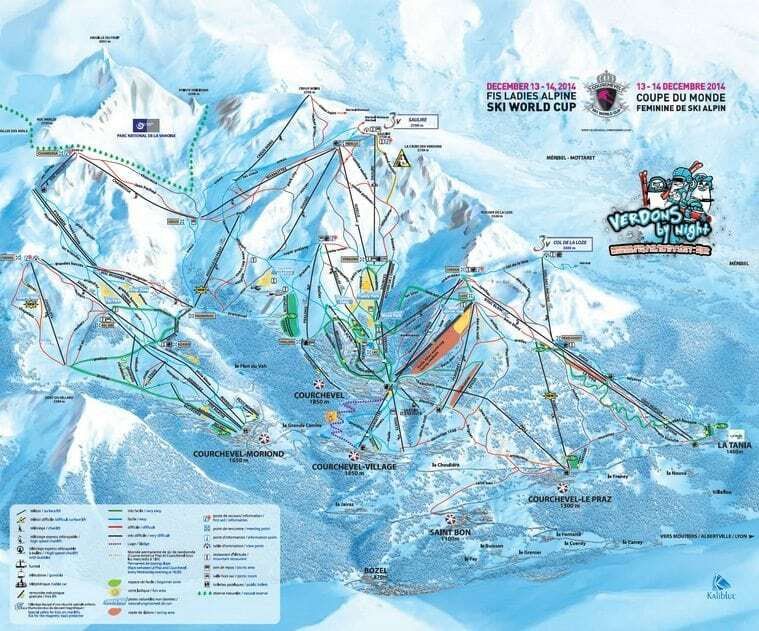 With just two lifts you can access the whole of Courchevel or drop down into the Méribel valley, making it an ideal base to explore the area and cover some serious ground. La Tania was purpose-built for the 1992 Albertville Olympics to house the media but has since turned into a thriving resort. La Tania is part of the Courchevel lift system and one of the 13 resorts that make up the Three Valleys. Although it may not be the largest resort, it definitely boasts some great skiing. Holidays are made easy in La Tania. The resort centre is pedestrian only and it is a family-friendly resort. If you are here to ski or just looking for a cheaper resort than some of the pricier villages up the mountain towards Courchevel 1850, La Tania is perfect. Enjoy the 600km the Three Valleys has to offer straight from La Tania and at the end of the day take the ever popular blue run Folyeres through the trees back into resort for the ultimate ski home for afternoon tea. Find the lesson that suits you in our La Tania Ski School. 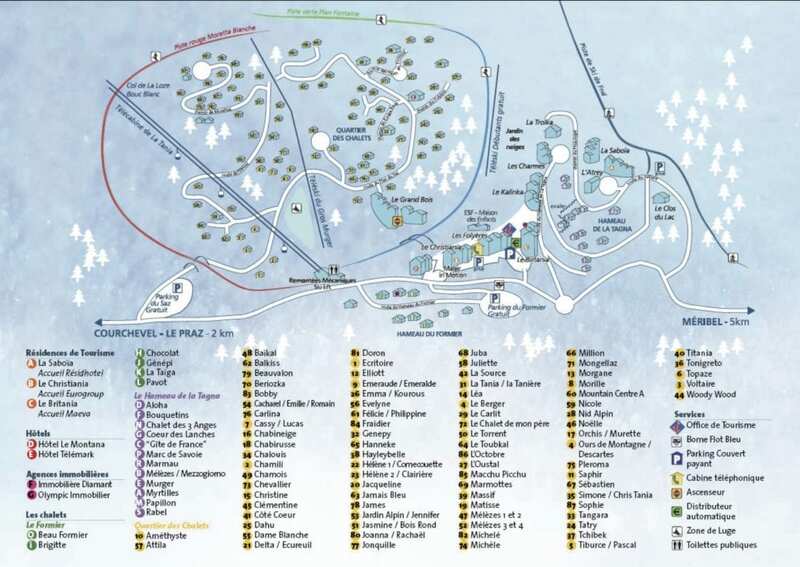 Click on the images for high res downloadable piste maps of La Tania and The Three Valleys. Best Ski Runs in La Tania – our pick of the bunch. Part of the Courchevel ski area and with the rest of the Three Valleys in easy reaching distance it’s easy to see the appeal of La Tania. This purpose-built resort remains a firm favourite with families but it has plenty to offer skiers and boarders of all levels. There’s a myriad of blues and greens above the resort and heading towards 1850. And then once you’ve found your feet there’s the option to drop into Méribel within minutes, or head to the top of Saulire where the world is your oyster. Then, once you’re done for the day, there’s one last blast down Folyeres to enjoy. This picturesque route through the trees takes you back to the village with one or two fun rollers thrown in for extra measure! Magic Carpets – The are two separate magic carpet areas in La Tania. One just at the base of the village where rumour has it that an expanded beginners area will be opening this coming winter 2017/18. The second magic carpet is a lovely gentle area just at the top of the La Tania bubble. Plan Fontaine – Once you’ve mastered the magic carpets, give the windy and fun green run a go all the way back down into resort. Jardin Alpin & Verdons – If you want more open green runs to practice your turns, head over to Courchevel 1850 for the day. The beginner area is a lovely gentle slope or you can take the Verdons bubble up and ski right back down into 1850 down the rolling green run. Folyeres – With rollers through the trees, it follows the curve of the mountain, giving you some fun turns. Hands down a favourite. Méribel Village – There are also some lovely blues down to Meribel Village just around the corner. Anemones or Lac Bleu – Gentle blues down into Courchevel. Dou des Lanches – A super steep black run from the very top of La Tania. Jockeys – Also a fan favourite, which starts just at the top of the Foret chairlift. Jean Blanc – Just at the top of Plantrey chairlift, this is an awesome one on a powder day because they rarely groom it! Off-Piste – If you prefer exploring outside of the piste markers, under Dou des Lanches chair is the epic La Tania off-piste section. Easily accessible so lots of people head that way, but if you get there first thing you can do endless loops and get a bunch of great lines in. Or just scoot through some of the many tree runs in La Tania. The Courchevel valley is well renowned as a foodies paradise and rightly so. From your base in La Tania, you can choose from restaurants locally, or jump on a bus to head further afield. The Chrome Bar – Situated at the foot of the piste in La Tania, the Chrome Bar serves great value meal deals for around 11€, including a beer or soft drink. Choices include burgers, pizza, and paninis. If you like your burger cooked through though be sure to ask as they come pink as standard. Open for lunch only until 3pm. Snow Food – Perfect if you want some takeaway or a bit of food out on the terrace. They offer cheap paninis, burgers, and pizzas. Open for lunch and dinner. Pub Le Ski Lodge – The ever-popular La Tania staple serves tasty burgers, pasta and plat du jours starting at around 10€. And with a great sun terrace, it makes a lovely spot to wile away the afternoon. La Taiga – Situated just across from the bus stop, La Taiga serves Savoyard specialties, meat, and seafood from around 15-30€ a meal. A quieter spot for lunch, and great for dinner as well. Les Marmattons – A favourite French restaurant right in the center of town. 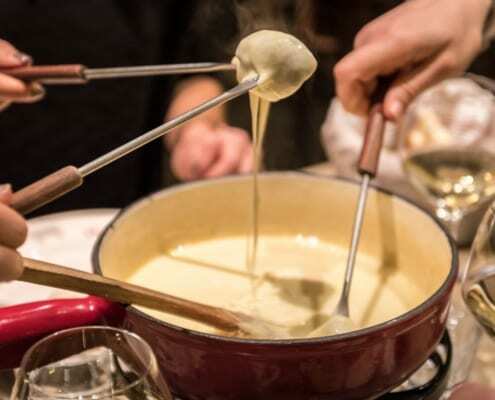 They have delicious pizzas, fondue, hot rocks and other Savoyard dishes. Starting from 15€ per plate. Le Bouc Blanc – For a great sit down lunch on the mountain, you can’t beat La Bouc Blanc at the top of the La Tania bubble. Large portions and reasonable prices for a mountain restaurant make this spot not only good value but with spectacular views of the mountains. Don’t miss their Café Gourmand for a tasty selection of deserts or grab a Chocolate Chaud to warm up before heading back down to your chalet. Azimut – If you fancy treating yourself on your next visit, without re-mortgaging your home, then give this spot a try just down the road in Le Praz. With 1 Michelin star, the food is impressive but without the stuffy service. Menus start at just 30€. Le Farcon – You might be surprised to know that little La Tania boasts a Michelin-starred restaurant, but it does indeed. This can be pricey for dinner but they do a reasonably priced menu for lunch (considering the standard of food). Although La Tania is a smaller resort with only a handful of bars, there is still a busy nightlife scene in town. Here are a few spots you can grab a drink or see some live music. Pub Le Ski Lodge – If you’re looking for a good après or night out, head to the Ski Lodge. The huge terrace is perfect for an après drink in the sun, but once the night rolls in, the Ski Lodge takes on a whole new life. The floor can get sticky with beer, the seasonnaires tend to flock here and it gets quite hot inside! With live bands throughout the week and beer taps flowing, there is always a party happening here. La Taiga – The Ski Lodge’s somewhat upscale sister bar is located just across from the bus stop. If you head here in the early evening it is usually a bit calmer and has a loungey vibe where you can get an array of cocktails and beers. They also have bands on here a few nights a week. The Chome Bar – Perfect if you want to head where the French hangout, see some live music and DJs and sip on some good Belgian beers. The Drop Inn – Down in Le Praz is a lovely little bar with a pool table, couches & TVs. It’s a laid-back, young scene with reasonably priced drinks. L’Elephant – Also in Le Praz, this is a great alternative to the Ski Lodge. Lots of live music on for après and nightlife and a bustling atmosphere. Cave des Lys – A place not to be missed. It’s a quaint wine bar inside of a cave. They have a huge wine selection and a menu with a number of nibbles – cheeses, meat platters, and more. Prior to 1990, there was a small hamlet between Meribel and Courchevel called La Tagna. The name meant ‘bears dwelling’, in reference to the bears that lived in the Tarentaise forest until the early 20th century. In the late 1980’s, the local council decided to turn it into a ski resort. Just in time for the 1992 Albertville Olympics, the resort officially opened on December 22, 1990, and soon after was renamed La Tania to prevent mispronunciations. It was used to house ice hockey players and journalists during the Olympics. But since then, the village has quickly grown into the resort you know and love today. It’s about a 9hr drive once in France to reach La Tania. The benefits of driving are no luggage restrictions and the option of an extra day skiing during a week’s holiday but the tolls can be quite pricey on the motorways so something to consider. The Eurostar offers overnight trains direct from London St Pancras to Moutiers (about 25mins from Courchevel, at the foot of the mountain). If you don’t mind overnight travel, and can sleep on trains (or are willing to forego sleep) then this can be one of the cheapest and most convenient ways to reach the Alps. Plus, no extra charge for ski carriage. You just need to be able to carry all you can bring…..
Chalet holiday specialists. They have a range of chalets in 1650. Highly recommended. If you are coming to the resort then check out their great bar ‘Le Bubble’. Six luxury ski chalets in La Tania with professional chefs, hot tubs and close to the slopes. Quality apartments and chalets in La Tania. They have outdoor hot tubs! Ski in, ski out chalets in La Tania with hot tubs, ensuite facilities, log fires, breathtaking scenery, delicious food, and friendly staff. 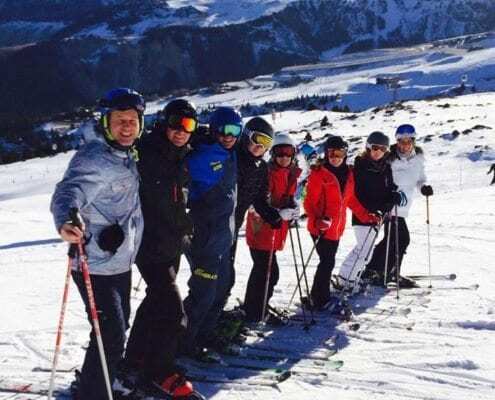 Comfortable, honest, and friendly catered ski chalet holidays in La Tania and Le Praz. Holidays for families and adult groups for nearly 20 years with in-house childcare, equipment hire, transfers, and friendly, efficient staff. 8 quality chalets in La Tania. Cosy one bedroom apartment. Ski to the door. Everything you need for an excellent self-catered holiday in La Tania. 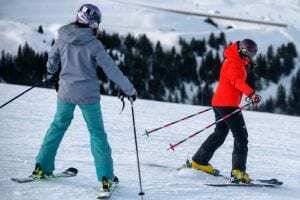 Ski deals and cheap holidays with the biggest tour operators in Courchevel. How can I reach other villages in the Courchevel valley? 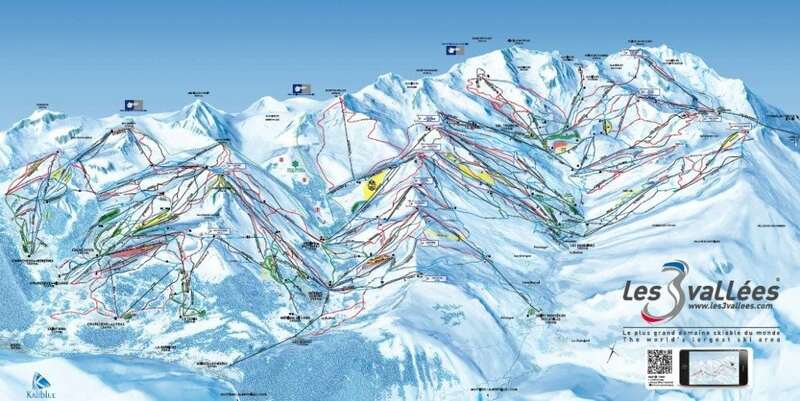 There is a regular but service linking up Courchevel 1850, 1650, 1550 and Le Praz. La Tania is linked to this bus service with buses once an hour during the day and less frequently in the evenings. For rental we recommend Ski Set, who offer a special discount available through this link. If you are considering buying ski boots we recommend The Boot Lab in Courchevel 1650 or Meribel. Boots are fitted by boot fitting specialists, and come with a through free assessment and comfort guarantee. Where can I find more information about La Tania and the Courchevel valley? Useful website written by La Tania locals with regular news stories and snow reports. Great site written by Three Valleys locals with insider tips and hints on where to ski, eat and drink, and lots more. The official site for La Tania. Sherpa Supermarket – A small supermarket located behind the Ski Lodge, usually is open until around 19:30. Bakery – Just across from La Ferme restaurant the bakery is open daily with breads, croissants and pain au chocolates as well as a few sandwiches at lunch time. La Saucisse – A small delicatessen with local cheeses, sausages, and wines. They also serve lunch sandwiches to go, and pizzas and tartiflette in the evenings. Ski Shops – There are four different ski shops in town for ski equipment as well as clothing and other gear. What services are available in La Tania? Doctors – There is an English speaking doctor inside the Medical Centre in La Tania, located beside the gondola station. No appointment necessary between 9am – 6pm. There is also a private doctor’s office in Le Praz with an English speaking doctor at Le Cabinet Medical, just around the bend as you head up to Courchevel. Pharmacy – The nearest pharmacy is in Courchevel 1650, on the main street next to Super U. Or alternatively if you are skiing, you can access the pharmacy in Courchevel 1850, just down the street from La Croisette. Post Office – You can buy stamps and mail letters and packages at the post office located inside the tourist office. Tabac – La Tania also has a Tabac where you can buy same day UK newspapers and any La Tania souvenir you could possibly want. Cash Point – There is a cash point just to the left of the tourist office. 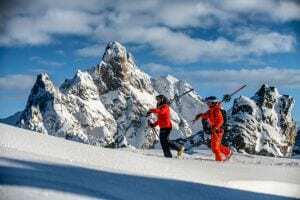 What non-skiing activities are there in the Courchevel valley? 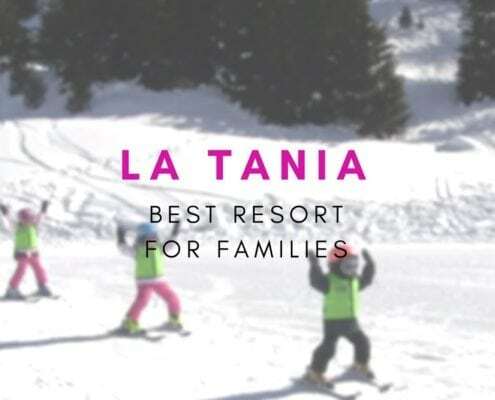 La Tania is a purpose-built family resort within the Courchevel valley and as such there are plenty of non-skiing activities for non-skiers within your party or for those looking for a rest day during your holiday. Sledging – The kids will stay entertained for hours when the piste turns into the perfect sledging spot after the lifts close. Ice skating & bowling – In Le Forum in Courchevel 1850. 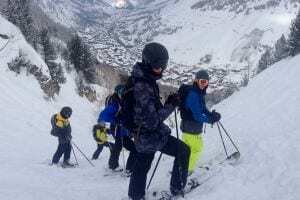 Guided snowshoe walks – Get off-the-beaten-track and discover the “real mountains” with Mark Tennent from Simply Savoie. T4 offer a private nanny service in Val d’Isère, Tignes, Méribel, Courchevel, La Tania, La Plagne and La Rosiere. They hand pick nannies who share the belief that undivided attention, fun and getting involved are the key ingredients to a happy family holiday.